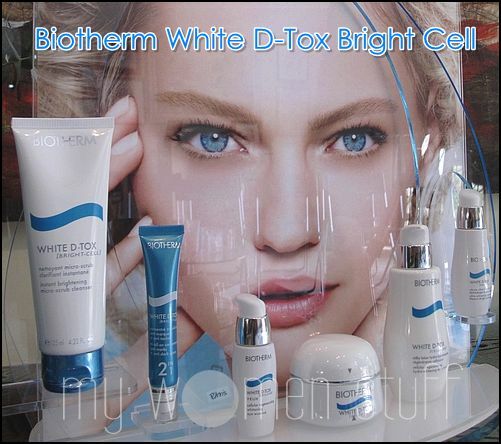 For 2010 Biotherm has improved on their White D-Tox range of products. I hardly recognize the line anymore. 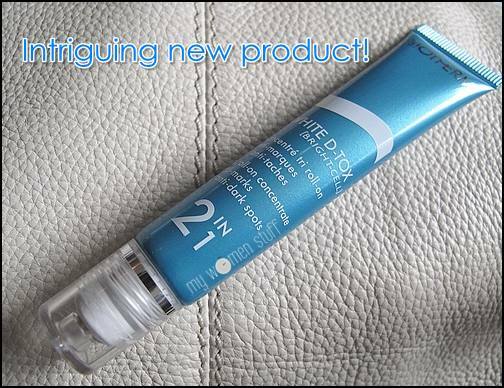 The blue looks deeper (and more elegant) and the products now boast a formula and technology that works from your genes to prevent melanin from darkening and causing pigmentation. Whilst the star product for Biotherm is their Bright Cell Essence to visibly brighten skin in 1 week, my interest was piqued instead by a very intriguing new product – the Biotherm White D-Tox Bright Cell 2 in 1 Roll on. This is a roll on in a tube that targets specific areas to prevent skin darkening and to resurface the skin to peel away the dull skin. I will tell you more about this one once I give it a go. It is supposed to work on dark marks too e.g. old acne marks so that is very promising for those who would like to reduce the appearance of such marks on their skin. PREVIOUS POST: PB Needs Your Help to Rec a MAC! I test drove it for 2 weeks. It works to a small degree and its sorta fun but you’d need to be very diligent and use it at least twice a day for there to be any effect. Because it comes in a roller thing I tended to forget so effects showed up slower on my skin. I don’t know – maybe I’ll go try it on a mole (the sort on the skin not the animal). Moles are slightly different from normal pigmentation right? Hi geekchic. i had my moles removed with acid peel by a certified skin specialist. it may take up to 2 visits but it works. i have tried cosmetic & OTC products but imo i see no effect. Where are you located, Paris B???? I’m in the U.S and i dont see this WHITE D-TOX TRI ROLL-ON CONCENTRATE on the Biotherm US website, where can I purchase this???? I’m located in Malaysia. Not sure if this item is Asia exclusive. If anyone has seen it outside of Asia please holler. I’m from Mexico and they sell it in department stores. Does it work? You can read about the White D-Tox Roll On here and the White D-Tox serum and moisturiser here.